What If I Told You. . .
Thirty Days From Today You Would Be On Your Way To Changing Your Life By Joining The Ranks Of People On Six Continents Who Run Their Own Business As An “Online Entrepreneur”? This world holds possibilities that no other career path could ever fulfill, and is one where beyond the sky is the limit for income, dreams, and goals. The only thing stopping you is the knowledge and training of how to get started and scale your business to the level that makes sense for you right now. 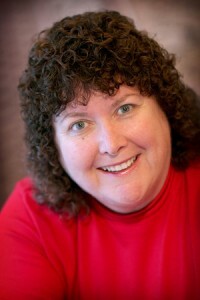 I’m Connie Ragen Green and I have been working exclusively online for ten years now. When I first encountered the world of online marketing back in the spring of 2006, I was enthralled with the idea of “making money while I slept”. I soon discovered that this was hard work and set about to learn as much as I could during my every waking hour. It was a steep learning curve for me because I had little guidance from anyone actually doing this successfully and even more distraction from people peddling bright shiny objects at me. Now I am able to earn income not only while I sleep, but also while I travel, play, spend time with family and friends, and more. Later on I’ll tell you exactly what I did to make a name for myself in this way. For now, let’s continue with what I want to teach you. There are too many ten dollar products out there that promise big results but can’t possibly deliver. Even I can get caught up with these in hopes of learning something new that will benefit my business. The truth is that a seven or ten dollar product will only give you a tiny bit of information, without outlining a blueprint for success from where you are now to closer to where you want to be. Online marketing is a real business, and as such requires training from someone like me who has been there and done all of that consistently for ten years now. Allow me to be your guide through this Six Module live training that will set you up for success during 2018 and beyond. But What About The “Rolls Royce” Promises Of Riches? Long gone are the days of internet marketers bragging about their fancy cars, mansions, and lavish vacations in exotic places. Remember those photos people used to show that made you believe you could buy their product and almost instantly live that lavish lifestyle as well? You won’t see those photos on sales pages ever again. Why? It’s because the FTC (Federal Trade Commission) cracked down on that insanity several years ago. The idea that any one product or course could turn you into a millionaire is absurd and detracts from what becoming a successful online entrepreneur is really about – learning how to do business in an honest and straightforward way by sharing your knowledge, expertise, and recommendations with people around the globe who will benefit from their connection with you. This isn’t a course on the theory of online marketing. Theory has its place, but this course – the Internet Marketing Six Pack – is about the practical side of planning, setting up, and running a business from home, or from wherever you happen to be in the world with an internet connection. Over the past ten years my business has carried on profitably from the beaches of southern California, internet cafes across Europe, remote areas of Asia, as well as from my home offices in both Santa Barbara and Santa Clarita, California. I’ll teach you exactly how to do the same thing, in a way that suits your lifestyle and goals. I have more years of formal education than I care to admit. In fact, I was something of a professional student well into my forties. Looking back I now understand that much of what I learned was theory, when what I truly needed was information on what was working at that time. Whether I was in graduate school working on an MBA, a law degree, or a Master’s in Technology and Instructional Design, the professors dwelled on what “could” be effective more than on what was proven to work well in practice. My promise to you is that I will only cover and teach you what is working in 2017 and on into 2018. Just as I do with my Online Marketing Incubator and Platinum Mastermind clients, my goal with this live course is to keep it simple. By this I mean that you will only be exposed to what you need and what is working for me and for other successful online marketers. My promise to you is to not waste any of your valuable and precious time with training that is not absolutely crucial to your success. Instead of teaching you the history of online business, I’ll be teaching you the exact, step-by-step blueprint that will bring you close to success in the shortest period of time. Earlier I promised to share exactly how I’ve been able to make a name for myself in the online marketing space. The secret is actually not so secret after all – I keep everything simple and just keep moving forward with writing (blogging, short reports, and full length books), creating information products and online courses, mentoring other entrepreneurs, and doing all of the things I’ll be teaching you in this training course. Online entrepreneurship is a worthy goal, and one that can only be accomplished by doing, not by continuing to learn more and more and not applying anything directly to what you are working to achieve. At the end of each of the Six Modules of the Internet Marketing Six Pack you will be given an Action Plan of what to do next to see measurable results right away. And by applying what you learn you will then have different questions. This training builds upon what you already know, what I will be teaching and sharing with you, and what you find out for yourself as you take directed action each week. But Isn’t It Too Late To Become A Profitable Online Entrepreneur? The Reality…It’s never too late to achieve your goals and dreams in any aspect of your life. The Problem…Society and the media work hard to convince us otherwise, using excuses like age, education, and connections. The Solution…Determine your own financial future by investing in yourself and learning the skills that will change your life forever. I started online at age fifty, with almost no technical skills or writing ability, and firmly believe that anyone can be successful at this. You already have the most valuable experience there is – life experience. Starting an online business allows you to draw upon your past trainings, education, and experiences and to lay a solid foundation for what is to come. Whether you’ve held a job, managed a household, helped a friend or family member achieve a goal, or overcome a unique situation in your life, you are already part of way to where you need to be to run a solid internet business. The Internet Marketing Six Pack Is Coterminous With Your Great Success! 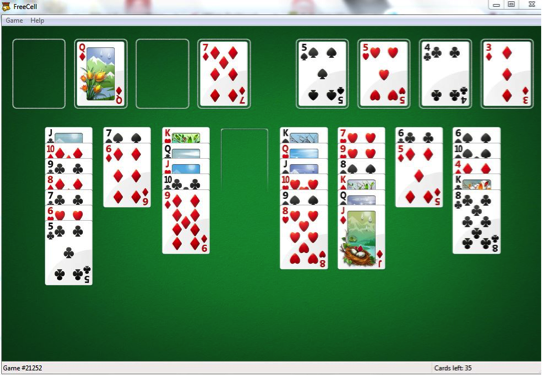 I’ve been playing a virtual card game called Free Cell on my computer for about ten years now, and I used to believe that I had to get all 52 cards in order before I could win. A few years ago it dawned on me that I really only needed about a third of them to be lined up properly for that to happen. In the image above you’ll see that I still have 35 of the 52 card deck remaining, yet everything is in place for me to accomplish my goal of winning. After I took this screen shot I made just five clicks of my mouse and won the game! And I’ve got dozens of screen shots showing similar results. Sometimes I only need to get ten or eleven cards into place before winning the game easily. In the beginning this was more of a challenge, but consistent and focused practice makes it all child’s play. You can use this same strategy to build a profitable business and change your life forever, giving you the time and financial freedom to live life the way you choose. You deserve that and I would be honored to be the one to take you there. So, does this analogy work every time for me? Heck no! In fact, my winning average for this game is only forty-two percent, meaning that I can’t even successfully finish half of the games I attempt. But I still feel like a success and enjoy playing almost daily. I’m at over twenty thousand games attempted at this point in time. I’ve been online eleven full years now, since the spring of 2006, so it just makes sense that I’ve had more opportunities based on this longevity. I became a “super affiliate” with just a few hundred names on my list, count most other successful online marketers as friends and have them on speed dial, and have access to some of the most brilliant minds now working online. If you’re just getting started, have no list or a list of fewer than a hundred names, it makes sense that you will need different tactics and strategies to rise to the level you want and need as an entrepreneur. And that is exactly why I feel uniquely qualified to take you by the hand and move you closer to where you want to be within the next month. What is online marketing and entrepreneurship? Why is it so important to build an online business? What if I get started with this right away? Who does my target audience consist of? Which streams of income are best right now? Which business models fit my lifestyle? What are the seven most profitable niches? Two one-on-one calls with me to discuss your specific situation and to set a course for the next thirty to ninety days for your new business. My promise to market your first (or next) product to my entire list and community through your affiliate link. This will make me your very first Joint Venture partner! P.S. There is limited seating available for this training course because of the personal attention I am giving to each student throughout our time together. Please do not delay. P.P.S. You will have full access to all sessions and trainings for The Internet Marketing Six Pack for two full years from the date you join. This is almost unheard of in my world and I am thrilled to offer this to you because my goal is to serve your needs and to help you achieve your goals.